I’m just going to go ahead and say it, I’ve never been very keen on graphs. 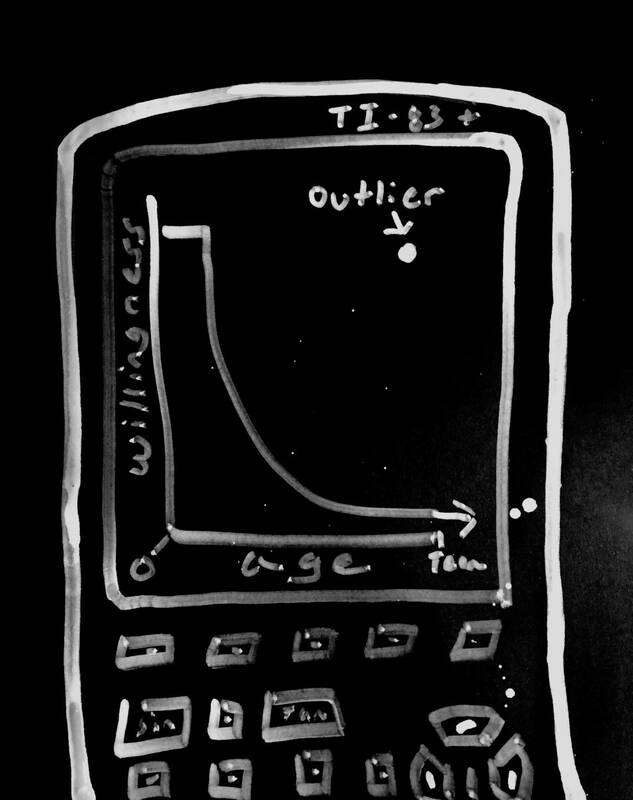 In fact, memories of stumbling through high school homework requiring digital graphing on the futuristic TI-83 calculator still brings frustrated shivers (except, of course, for the game of Snake it came with). But, for the sake of a visual aid, I’ll indulge on this rare occasion. On the X-axis, we have age. 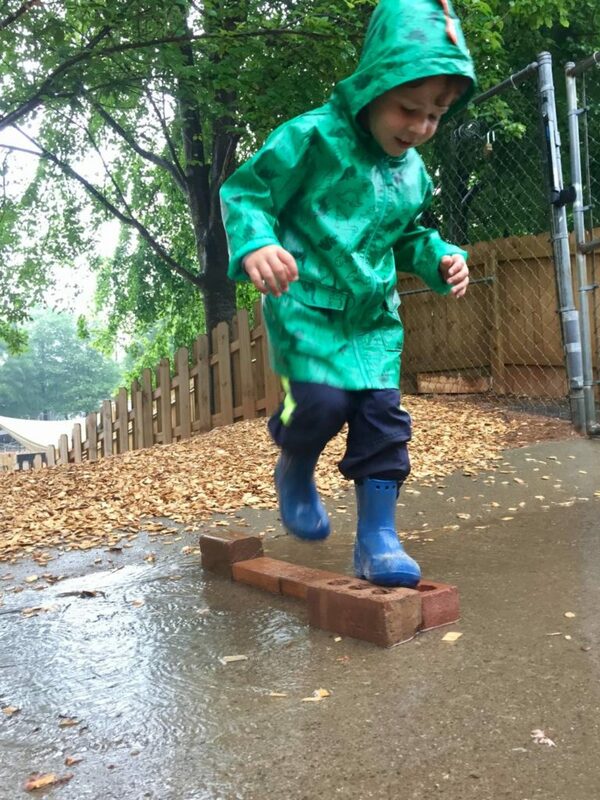 On the Y-axis, we have a person’s willingness to stay out in the rain and get completely soaked. As one can see, somewhere around middle school, the willingness starts to taper, and by young adulthood it disappears for the rare exceptions of emotionally charged movie scenes and changing a flat in a rainstorm. Now, with all that complicated math out the way, I want to share an exceptional teacher moment with a joyful group of tiny world adventurers and knowledge makers. Rain jackets button up to the chin, boots yank snugly over rapidly growing toes, hoods cover wisps of hair. 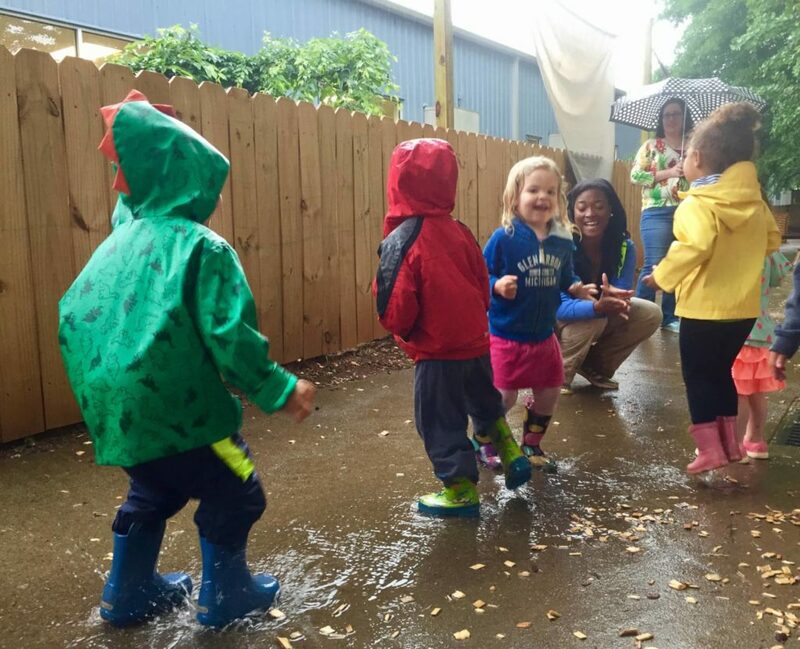 A group of children wait anxiously before the door, squirming to find the puddle they know will be greeting them in all its muddy glory. 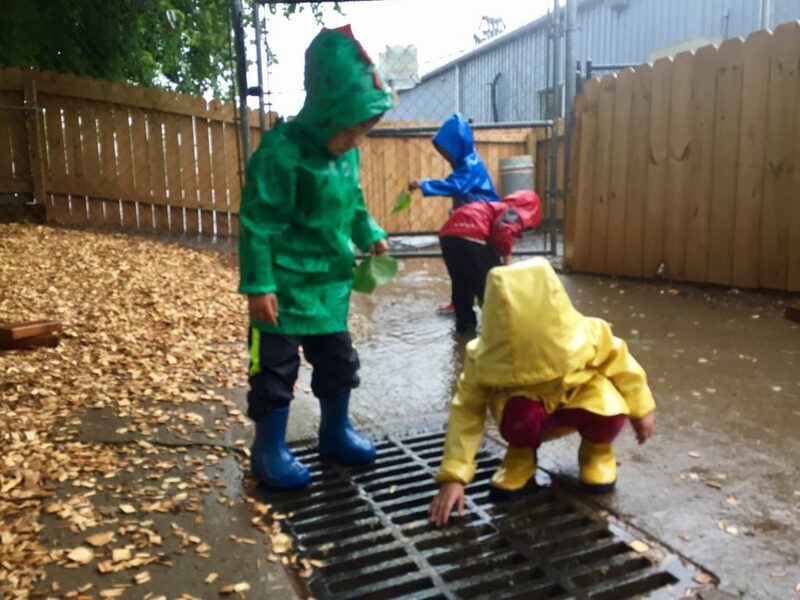 With our ever-deepening puddle hole recently covered up by our new layer of mulch, and two of our favorite features deemed too wet for use, nature forces us to find a new perspective on our playground. After exploring a quick refuge under the cover of our tiny house, we wander back out into the warm Georgia spring rain. As if trickling through a enormous coffee filter, huge droplets of water steadily drip from the center of the shade tarp covering the sand. Silently placing a bowl beneath the drip makes a subtle suggestion as the children begin to gather around the discovery. 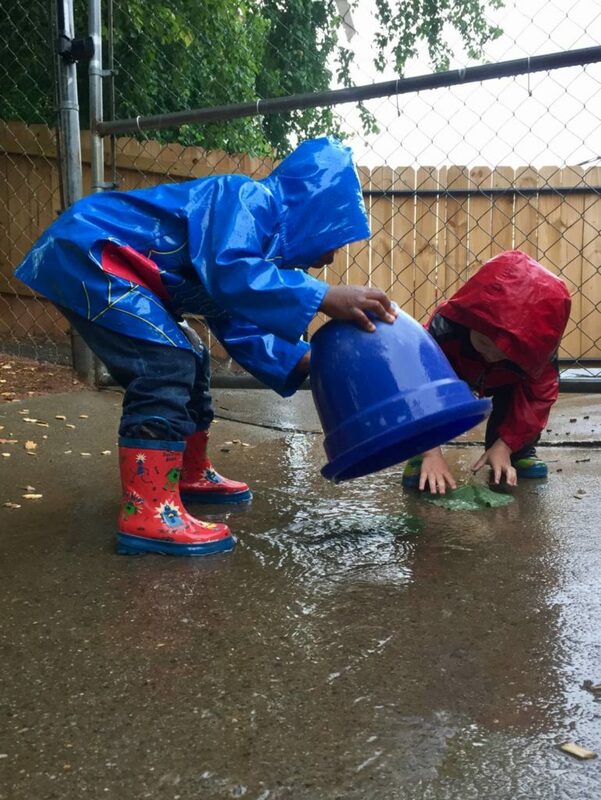 From this simple drip, emerges an array of actions that speak to the individuality of each child. 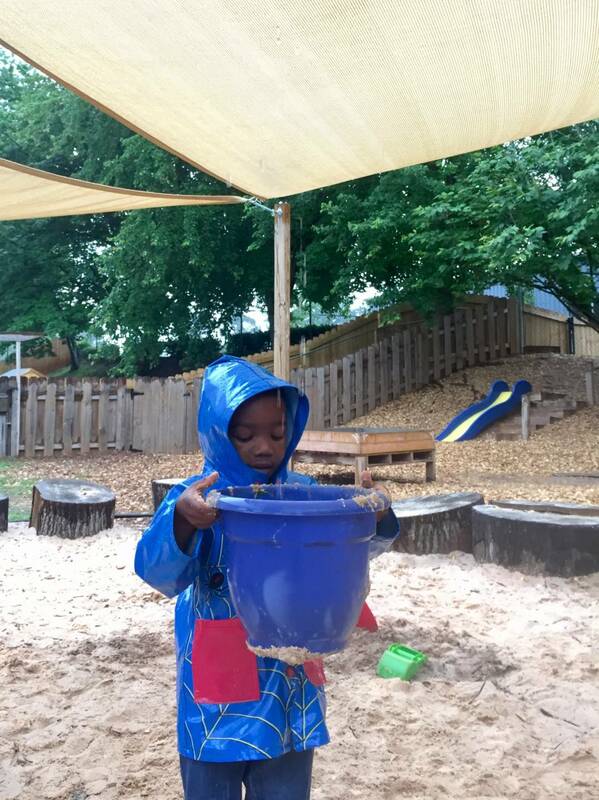 H. and E. fill pans and dump them over their heads to wash their hair, L. and S. use the water as an ingredient in their sand cooking, and A. simply stands beneath the stream with his eyes closed and tongue out. 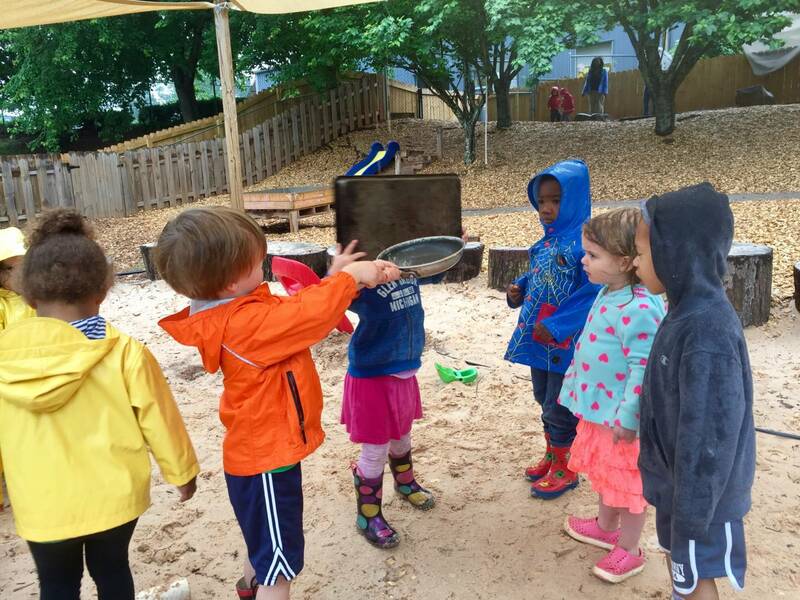 In the creation of provocations and material offerings, embedding an underlying notion of open-ended possibilities allows children to interpret and interact in a multitude of ways that speak to their exploration “language” of choice. Of all provocations, sensory material offerings often hold the greatest array of possibilities. 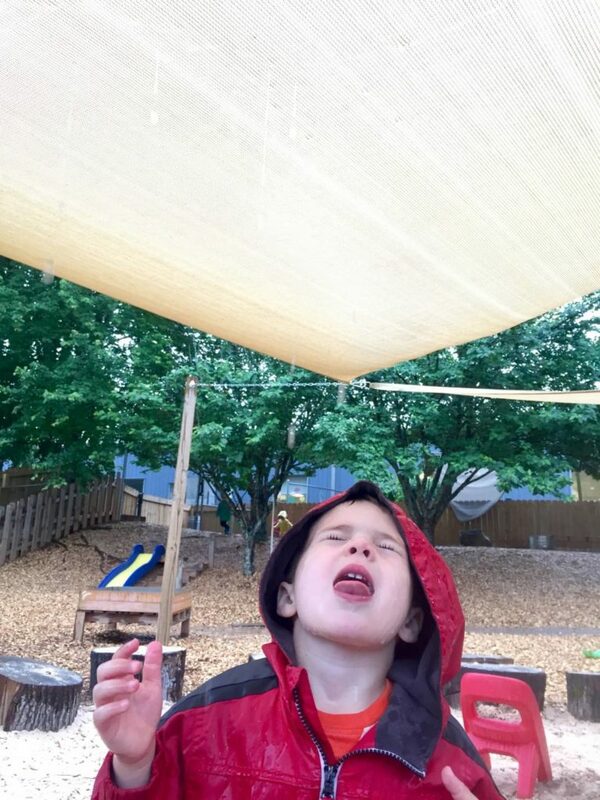 Despite all the intentionality a Reggio-inspired educator uses in the creation of provocations, sometimes nature effortlessly makes provocations that far surpass the skills of even the most experienced educator. At this point in the story, I find myself an outlier on our opening graph; you know, one of those X-Y coordinates who didn’t ask for directions and wound up lost in some unknown quadrant. Except, I’m not lost. I know exactly where I am, floating somewhere between the current moment and memories of a childhood spent almost entirely outdoors. My dad even bought a Flowbee razor to keep my buzz cut exceptionally short in order to save my mother a few minutes in nightly deer tick checks during the New England summers. Blessed with a large backyard and surrounding city watershed property, I roamed an outdoor space filled with creeks, rivers and tiny waterfalls. For hours, I would build dams, catch salamanders and send tiny leaves down the stream as boats. 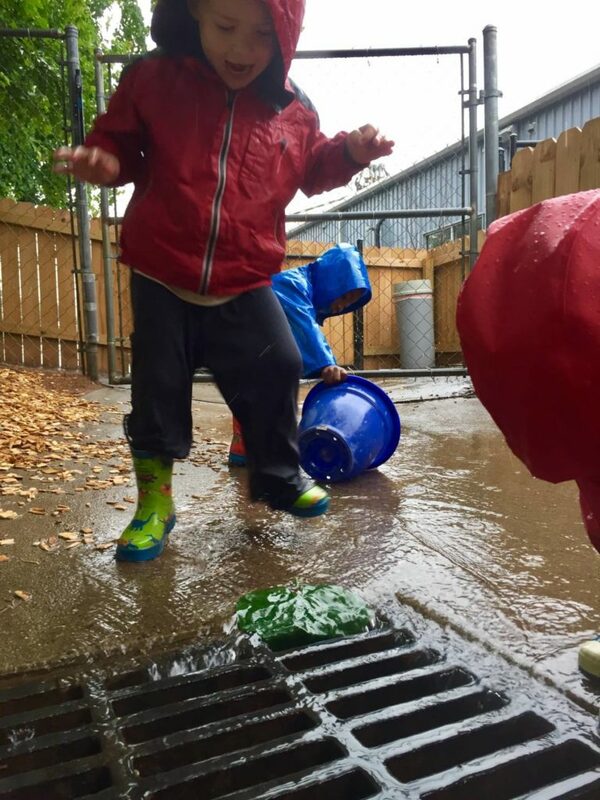 It was these early years of my life that I lived comfortably willing to be rain-soaked. 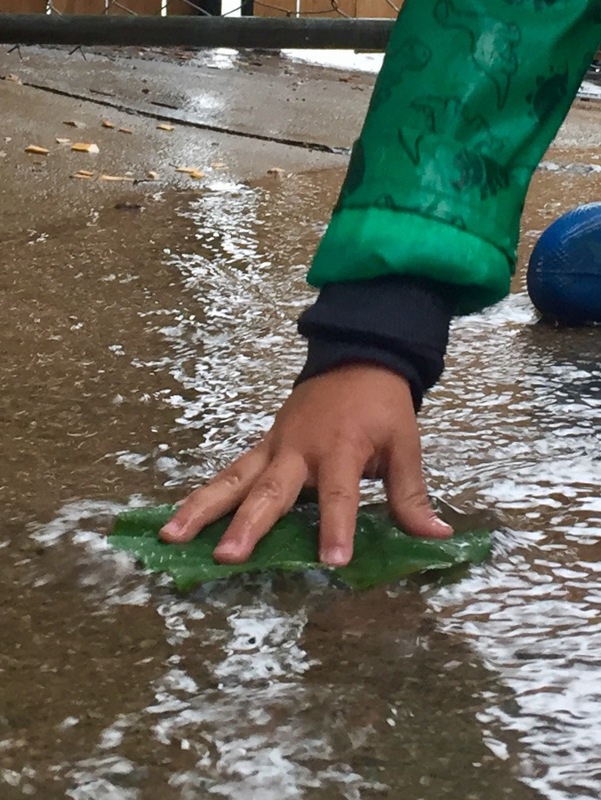 From the tree overhead, I grab a leaf and silently drop it into our temporary sidewalk stream. As it floats by and disappears into the drain, it catches the eye of the group. I reach up to grab a few more leaves and offer one to each child. 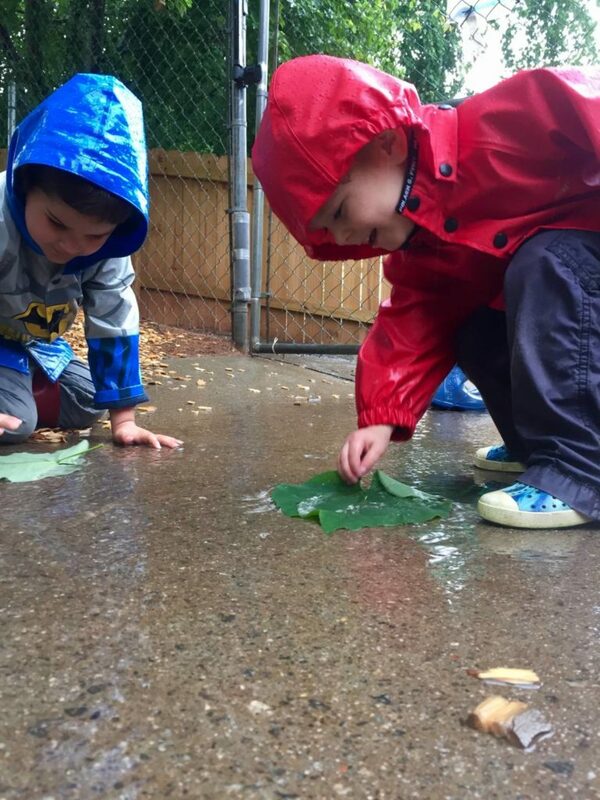 Each little hand skeptically drops the leaf into the water, excitedly shouting as they try to grab it. A few dozen leaves plucked from every type of tree on our playground and roughly twenty minutes later, there is not a single cotton fiber left unsaturated. The rain keeps falling, the stream keeps flowing and, eventually, we reluctantly return indoors. I have a theory about jumping into particularly cold bodies of water. It goes something like this: cold water is like a fire that sparks a slow burning candle in the spirit, reawakens the senses and opens your eyes to the crispness of the world. I also have a theory about children. That one goes something like this: without the world exploring nature of the child, adults would miss out on some of the most dauntingly grand simplicities in life. 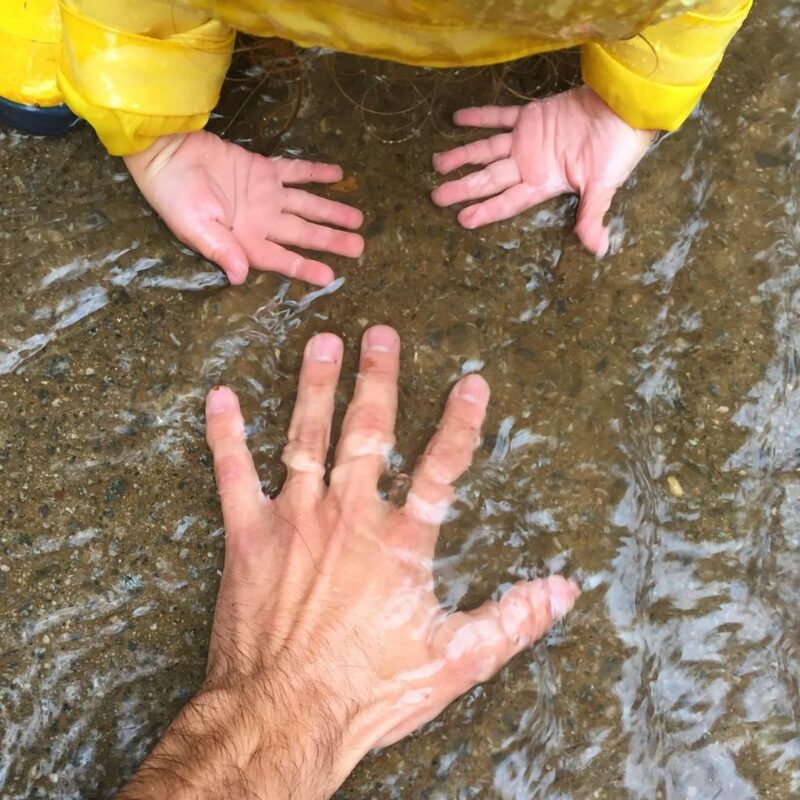 For an hour, I felt the rain, washed my hands in the warm stream and walked away an exceedingly more joyful human than before. 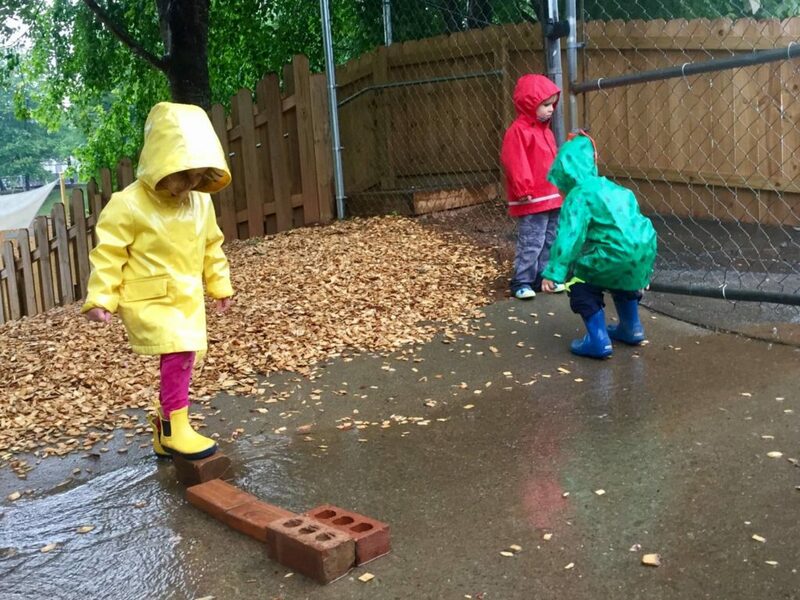 A little willingness and a lot of rain go a long way.